Okay, so the Steelers didn’t make it to the Super Bowl this year. But does that mean we stop celebrating them? NO! I’m really excited to share this dip with you for your upcoming party! The black bean dip is a bit spicy, and the sweet mango puree is its perfect compliment. 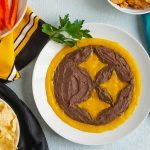 Steeler fan or not, everyone will love it, and it will be gone in no time! And here’s the bonus: this is made with all healthy foods, and no added sugar or salt! Nomnomnom! 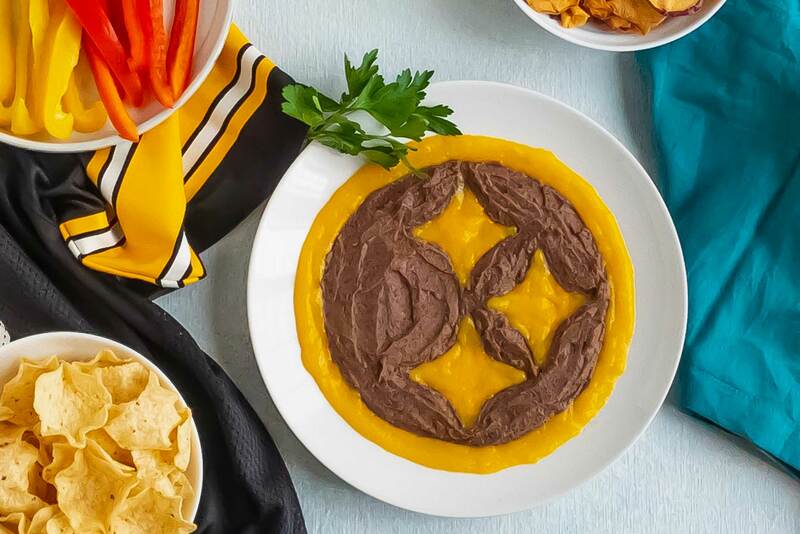 Everyone at your Super Bowl party will love this dip, Steelers fan or not! Add all ingredients except mango to a food processor, and process until smooth. Scoop into a bowl and rinse out food processor. Add the mango to the food processor, and process until smooth. 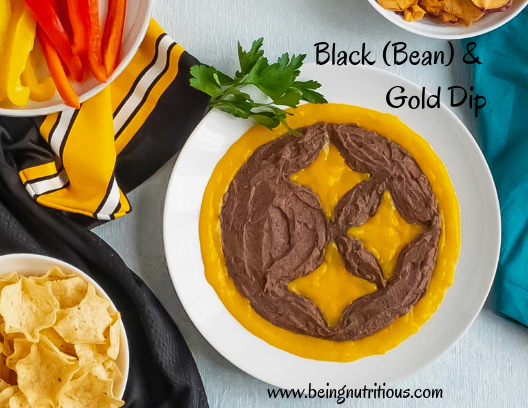 Combine the black bean dip with the pureed mango in any way you like! I created the design in the picture by using piping bags (for cake decorating) and smoothing it out with a spatula. If you don’t have piping bags, and you use a ziplock bag and cut one of the corners off to make a makeshift piping bag. Or just load it all in a bowl and dip away! I have been waiting for this!! Thanks Laura! You got it! Hope you enjoy!